Tour Operators The Solovetsky Islands (Solovki) are an archipelago situated between 64' 57" and 65' 12" northern latitude and 35' 28" and 36' 17" eastern longitude on the point of entering the White Sea Onega inlet in the Archangel region. Their area takes up 347 sq. km. The archipelago consists of 6 comparatively large (Bolshoi Solovetsky, Anzer, Bolshaya and Malaya Muksalma, Bolshoi and Maliye Zayats) islands and many smaller ones. It's been established that the settlement of these islands began in the early and mid-third millennium BC. There are many stone "labyrinths" of unknown origin around the islands. The Solovetsky monastery functioned from 1429 - 1436 up to 1920. For centuries the monastery owned huge territories along White sea coast, it was the religious, economic, political, ideological, cultural and military center of the region. From 1923 to 1939 Solovetsky Special Purpose Prison Camps (SLON) and Solovetsky Special Purpose Prison (STON) existed on the islands. During that time, hundreds of thousands of political prisoners were exiled to the islands. From 1939 to 1947 Solovki was the Northern Fleet's training squad base and from 1942 to 1945 - the Navy Marine School. 1967 marks the birth of the Solovetsky historical-architectural and outdoor nature museum. From 1960 work has been going on to conserve and restore the Solovetsk Monastery historical-architectural monuments. 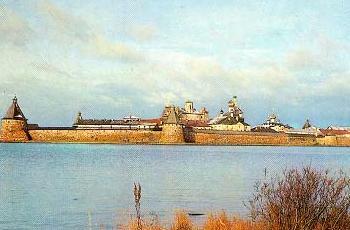 1990s witnessed the revival of the Solovetsky Monastery's activities. The islands' unique nature and over 180 archeological, historical and architectural objects attract many tourists.